IN Grand Prix racing there are basically two types of teams, the 'haves' and the 'havenots'. The 'haves' - teams like 'Marlboro' McLaren, 'Parmalat' Brabham, and the others at the top of the tree - all have enormous amounts of sponsorship, the latest engine modifications and the 'right' tyres. Their spaces in the paddock and pits are littered with spares; spare cars, spare engines, spare chassis and spare spares. Motor-homes and hospitality units litter the 'haves' areas in the paddocks, at Monte Carlo there may even be a yacht or two. Almost everyone seems to be walking about advertising the 'haves' sponsor's product, on tee shirts, hats, car coats, wet look jackets, even knickers for all we know! Walk around any F1 meeting and you will be assaulted by scantily clad girls giving out stickers and a variety of other material, all from Grand Prix racing's big teams. It is, I suppose, healthy for F1 racing that there are big teams like that, they are attracting money and publicity into the sport. Unfortunately, the injection of sponsorship money into motor racing over the past decade has greatly widened the gap between the big and the small teams, in terms of resources and results. The teams at the top of the tree seem to the outsider to be a kind of mafia, determined to keep what they have, and to allow no-one into their illustrious brotherhood. If a good new driver arrives on the scene, or is driving for one of F1's 'have nots' he is usually whisked into one of the big teams. Increasingly the poorer GP teams seem to be nurseries for new drivers and places where the big team's cast offs are put out to graze. Even designers who show promise rarely stay with the 'have-nots', they too are lured into the 'big time'. There is probably a 'big five' in GP racing, JPS, McLaren, Ferrari, Brabham and Tyrrell. Just below them are the teams knocking on the door, equipes like Shadow, Copersucar, Wolf, Ugier - teams that apart from the occasional victory haven't made a serious dent in the 'big five's' dominance. Then there are the new teams, ATS, Arrows, Renault, for example, some will make it like Wolf in 1977, others like Parnelli a few years ago will fall by the wayside. You are then left with the 'have nots' teams operating on a shoestring budget having almost to go bust to get enough races under their belt to qualify for membership of the F1 circus. The archetype of these teams is Morris Nunn's Team Ensign, who have somehow managed to survive four years F1 racing, apparently on a shoestring budget. Along the way the team has managed to give the big teams a fright, and grow into a professional two-car outfit without losing its reputation for being one of the friendliest of Grand Prix teams. In F1 racing success breeds success. It seems to work like this, the successful teams attract sponsorship, the big money, which is needed to be successful. Unless you have massive sponsorship it's impossible to stay at the top and continue to attract the sponsorship needed to stay there. It's possibie for a small team without a sponsor to upset the applecart every once in a while, like Hesketh did, but even a very rich man like Alexander Hesketh found that a bottomless pocket would have been needed to keep up the challenge. The unfortunate fact is that the media seem to direct all their attention onto the successful teams, the national coverage, and to a certain extent the specialist publications virtually ignore teams like Mo Nunn's. With little coverage to get their names known the small teams find it difficult to attract big sponsors, and so their chance of success is further restricted. When one adds up all the barriers in the way of Morris Nunn, and men like him, ever reaching the top of the tree one can only wonder why they carry on in Grand Prix racing. Man for man the Ensign team members probably work harder than any of the other teams, the team completely lacks the pretensions and trappings of commercialism surrounding many others. Ensign is a happy team, the members enjoy racing and must have tremendous belief in themselves and their other colleagues. Ensign is just beginning its fifth season of racing, during this time the team's best result has been fifth place. Ensigns have in fact finished fifth five times, sixth three times, but on more than a couple of occasions they had looked ready for the big breakthrough and better results, but each time something has happened to squash the hopes of success. However, Mo Nunn keeps his enthusiasm somehow, and Ensign keeps coming back for more, the way he sees it, I suppose, is that he worked so hard to get the team accepted in F1 that achieving success will be child's play after that. Ensign just wasn't taken seriously when they arrived, Nunn had little experience as a designer, although his F3 designs had won a number of races. The first Ensigns were solid, no nonsense designs, perhaps a little heavy when compared with the top F1 designs, Nunn knew that the car was a good one, but couldn't prove this because the standard of drivers who piloted the car was not very high. As the early design grew long in the tooth most people expected the unsponsored team to fade quietly away, especially when there was a large legal wrangle with some-time sponsor HB Alarm Systems, which resulted in that company taking over the then new Ensign design, which was renamed the Boro. In many ways 1976 was a make or break year for Mo Nunn and the fact that the team still survives owes a lot to that unlucky driver Chris Amon. At the beginning of 1976 Amon was without a drive, he was broke and hadn't sat in a decent F1 car since Matra retired at the end of 1972. Amon had something to prove to all the people who had refused him drives or commented that his ability had evaporated since 1972. From 1972-75 Chris was associated with some of the worst cars eve to appear in F1, even JC himself couldn't have made the Tecno, for example, competitive; many pundits ignored this fact and just said that Amon was over the hill. Morris Nunn was in a similar position to Amon, and as near to being broke as anyone could be, and he knew that Ensign would have to make some impression on the results to stay in racing. With the loss of the new Ensign to HB, Amon and Nunn started the season with the old, heavy car which, by then was nearer to a refugee from a motor museum than a modern F1 car. Nevertheless, Amon showed that the car wasn't bad, and finished 6th in the South African GP driving the car. The new Dave Baldwin designed Ensign introduced at Jarama and began Ensign's purple patch. Chrissy brought the new car home fifth after a race long dice with the works Brabhams. Many scribes were quick to put this performance down as a flash in the pan. The next couple of GPs were to show they were wrong. In Belgium Amon qualified the car seventh and was about to take third place from Jody Scheckter when a wheel fell off the car, the Ensign rolled and Chris was lucky to escape unhurt. In Sweden Chris qualified the car third, but went out of the race when well placed. Again mechanical failure caused an accident, this time the car slammed head on into a bank at 90 m.p.h., again Amon stepped unhurt from the debris. By now the flash in the pan theory had disappeared and rivals were seen peering at the Ensign trying to work out why it went so fast. Chris Amon was even being talked about as a top class F1 driver again. Mo and Chris allowed themselves the occasionally wry smile. After another retirement in the British Grand Prix the Ensign equipe moved to Germany hoping that their luck would change and the car would get the finish its performances deserved. Germany marked a major downturn in the Ensign team's life. Chris Amon refused to start in the race, for the first time in his career. He witnessed Niki Lauda's accident, and more importantly saw how long it took the rescue tenders to reach the crash. It was this that made his mind up not to start, the fact that he could have been stuck in a crashed car while it torched. A few days after the race Chris left the team, not because he had been sacked, as was rumoured at the time, but because the series of accidents had sapped his confiqence, this and business worries caused his-withdrawal. The remainder of 1976 was a great disappointment for Ensign and Mo Nunn. Apart from one vintage piece of Jacky Ickx driving, the Ensign’s pilots just couldn't get the best out of the car. It looked very much as if Ickx would be the Ensign's pilot for 1977, his last race with the team during 1976 was at Watkins Glen where he had the most horrendous accident imaginable, the car was chopped into two blazing pieces, one containing Jacky who luckily escaped with nothing worse than a broken ankle and minor burns. Ickx was edged out of the team when Clay Regazzoni, sacked from Ferrari rather unfairly, signed for Ensign a week before the 1977 Argentine GP. Using an updated 1976 car, the Ensign N177, Regazzoni spent a happy 1977 season with the team, enjoying the relaxed atmosphere much more than the pressure which one associates with Marenello. Mid-way through the 1977 season a second Ensign appeared, backed by Hong Kong businessman Teddy Yip, run by veteran team manager Sid Taylor and driven by Patrick Tambay. It was Tambay who had the best Ensign drive last season, holding down third place in the Dutch GP until fuel shortage forced him to drop to fifth place. Clay didn't really excel with the 177, he suffered from ill-luck, had more than his fairshare of shunts but was inconsistent, his best drives coming in Brazil, Sweden, France and the final championship rounds at Watkins Glen and Fuji. Clay managed 5 Championship points, for a sixth place at Buenos Aires and two fifths at Monza and Watkins Glen. Tambay also finished with five points, sharing 17th place in the World Championship, and his drives in the car were to earn him the second seat in the Marlboro McLaren Team for 1978. The '77, or MN06 to give it its correct designation, is a Dave Baldwin design, simple and unsophisticated it is almost the standard F1 machine. Baldwin incidentally designed the 1977 Copersucar which bears a striking resemblance to the MN06. All of Baldwin's recent designs, even the 1978 Van Diemen Formula Ford car, share the same configuration. Narrow chiseled nose, side radiators, and high cockpit. Baldwin's designs are always neat and tidy and the Ensign is no exception, from its debut in the 1976 Spanish GP the car has attracted attention for its exceptional tidiness and pretty appearance. 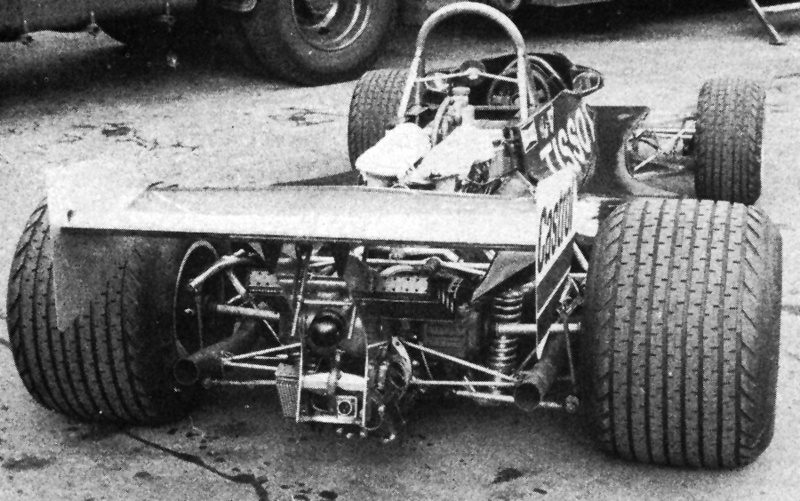 'British Standard Formula One' suspension gives the Ensign excellent handling characteristics. Regazzoni was very impressed with the handling and compared it favourably with the Ferrari 312. Clay felt the handling and braking of the Ensign were its most impressive points. The front brakes are twin caliper designs similar to those on the Lotus 77, using Mini-Cooper sized discs. The main fault of the 177 is its lack of straight-line speed, strange when one considers the smallness of the car, for 1978 the oil-cooler had been fitted in the nose of the car in an attempt to cut down on frontal area. Another failing in 1977 was the shortage of engines, at £15,000 each the 480 bhp DFV is an expensive piece of equipment, especially when it only has a life of 500 miles between rebuilds, which cost £2,000 a throw. Engine problems contributed greatly to Regazzoni's 1977 inconsistency. With support from Tissot watches and Castrol it looked as if 1978 might see the turning point for Ensign, Regazzoni, having had a season to get used to the team, was expected to improve on his 1977 showing. However, Regazzoni was lured away from Ensign by Shadow, leaving Mo Nunn driverless. Danny Orgais a class USAC driver, was drafted into the team bringing sponsorship from Interscope with him. The Hawaiian Ongais didn't really settle in F1, and has been replaced by Jacky lckx. A second works car is being entered this year for the first time, this is driven by Lamberto Leoni. Ickx has been written off as a GP driver by many critics, just as Chris Amon was two years ago, he has a lot to prove to his many detractors and every uncommitted GP fan will be hoping that he can make his point this year in the Ensign. After Amon's retirement from the team Mo Nunn hasn't seen an Ensign perform as well as when driven by Chrissy. The situation at the beginning of this season is very similar. to 1976, Ensign has a lot to prove, the driver has a lot to prove, money is still short and the team is still looked upon by many as one which will never win a F1 race. Wouldn't it be beautiful if Ickx could do an Amon and bring Ensign the results and recognition the hard-working team deserves?